On March 17, 2013, the authors of an anonymous email to the “Full Disclosure” mailing list announced that last year they conducted a full probing of the entire IPv4 Internet. They claimed they used a botnet (named “carna” botnet) created by infecting machines vulnerable due to use of default login/password pairs (e.g., admin/admin). The botnet instructed each of these machines to execute a portion of the scan and then transfer the results to a central server. The authors also published a detailed description of how they operated, along with 9TB of raw logs of the scanning activity. Online magazines and newspapers reported the news, which triggered some debate in the research community about the ethical implications of using such data for research purposes. A more fundamental question received less attention: since the authors went out of their way to remain anonymous, and the only data available about this event is the data they provide, how do we know this scan actually happened? If it did, how do we know that the resulting data is correct? We recently analyzed the reputation of a country’s Internet (IPv4) addresses by examining the number of blacklisted IPv4 addresses that geolocate to a given country. 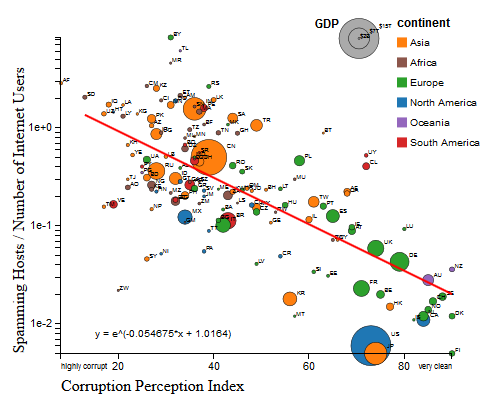 We compared this indicator with two qualitative measures of each country’s governance. We hypothesized that countries with more transparent, democratic governmental institutions would harbor a smaller fraction of misbehaving (blacklisted) hosts. The available data confirms this hypothesis. A similar correlation exists between perceived corruption and fraction of blacklisted IP addresses.